Lungta (Tib. རླུང་རྟ་, Wyl. rlung rta or ཀླུང་རྟ་, klung rta) literally 'wind horse' is a mythical Tibetan creature symbolizing the inner air or wind of the body and related aspects of the Buddhist path. By extension, Lungta has also become the name of practices (sadhana and prayers) related to —and causing the flourishing of— Lungta. The word lungta (ཀླུང་རྟ་, klung rta) is composed of two syllables: the first, lung, represents the element 'space' in the fivefold classification of the elements 'earth, water, fire, air and space' and signifies 'universal foundation' or 'omnipervasiveness'. [...] The second syllable ta (horse) refers to the 'excellent horse' (རྟ་མཆོག་, rta mchog), and since in ancient times in Tibet the horse was the symbol of travelling with the greatest speed, in this case it seems to refer to the transmutation of every thing that depends on the five elements from negative to positive, from bad to good, from misfortune to good fortune, from baleful portents to auspicious signs, from poverty to prosperity, and it implies that this should ensue with the greatest speed. [...] I believe this to be the true meaning of lungta. In more recent times the custom has arisen of spelling this word རླུང་རྟ་, rlung rta (wind horse), ascribing to it the meaning 'that which rides the wind', but I think this is derived from the practical function of the lungta flags of being raised in the sky and moved by the wind. 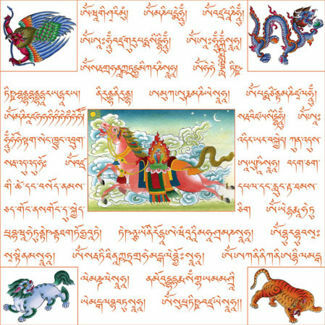 On the outer level, the lungta is a mythical Tibetan creature from pre-Buddhist times that combines the speed of the wind and the strength of the horse to carry prayers from earth to the heavens. Lungta is associated with positive energy or ‘life force’ and with ‘good luck’. It is both the subduer of evil and the vehicle of enlightenment. The lungta symbol is often depicted on prayer flags, which are flown to generate merit and increase one's life force. Lungta prayer flags typically display a tiger, a snow lion, a garuda, and a dragon, (the four dignities) with a lungta in the center. Certain lungta prayers also refer to these four symbols. At a deeper level, the lungta and the four dignities symbolize the play of the five elements, out of which all phenomena are formed. The lungta symbolizes space, the ground of all manifestation; in fact, in astrological texts lung ta is sometimes spelt ཀློང་རྟ་, longta, 'horse of space'. The tiger symbolizes the wind element; the snow lion, earth; the garuda, fire; and the dragon, water. Traditionally, they are set out in the same configuration as the five-part mandala used for the five buddha families, as can be seen in lungta prayer flags. In Tibetan Buddhism, the mind is seen as being dependent on, or mounted on, the subtle energy or inner air or wind within the body. This subtle energy is therefore called the ‘windhorse’, in Tibetan lungta. Whether the wind-horse is strong or weak determines whether positive or negative tendencies dominate the mind. On an everyday level, the windhorse is also very much linked to what is commonly known as ‘good luck’. "All the experiences [of the six realms] are the result of karma, and it is mind that is responsible for the creation of karma, nothing else. Every experience of passing pleasure and pain and all the seemingly small and incidental occurrences of our lives arise because of the mind. However, we have no power or control over the mind at all. We may have in our mind the intention of doing something of a very virtuous and positive nature, but if something goes wrong our mind can change instantly and become very negative. We can also experience states in which we are motivated in a negative, non-virtuous way and then find that our motivation changes and becomes positive. What really controls the mind is lung [Tib. ], the ‘wind’ or ‘subtle energy’ that determines the direction that the mind pursues. Thoughts arise in our minds and as they arise and we react to them, we create karma. The windhorse, the mount upon which the mind rides like a rider on a horse, controls or directs the thoughts arising in our minds. If we are confused about the essential nature of an arising thought, it may well be a cause for the perpetuation of samsara. If there is no confusion about the fundamental nature of the thought, the essence of that thought can free itself into dharmakaya. As the thought frees itself, the enlightened mind of buddhahood arises. The very same thought can lead to a state of freedom or to a state of confusion, and the direction it takes depends upon lung ta. Lung ta is actually sem, ‘the ordinary, conceptual mind’. When lung ta is low, everything becomes a problem: our ability to make progress with both our worldly projects and the Dharma will decrease. One of the signs of lung ta being low is not feeling well or being ill at ease. This is a common symptom in the present age; almost everybody’s mind is unhappy, unclear and dull. If lung ta flourishes and becomes more positive, then even former tendencies that brought about non-virtuous or negative karma—ordinary thoughts of the five poisons of attachment, aversion, ignorance, jealousy, and pride—can be transformed into a more positive manifestation. They arise in their true nature as the five aspects of yeshe, or 'primordial wisdom' of 'timeless awareness' (rigpa), through the power of lung ta. However, if our lung ta is neither flourishing nor nurtured, even if we are motivated to do something positive or virtuous, our motivation can change or be spoilt. For example, we might enter the path of Dharma and make attempts at establishing a regular practice, but find that our ordinary, negative thoughts drag us down and perpetuate samsara, because our lung ta is weak and our minds are continually weighed down by negativity. Even if people think they will practise the Dharma, do retreats or meditate on compassion and emptiness, unless their lung ta is stable the outcome will be the opposite of what they intended. From the outset the lung ta of beings throughout the three realms and of ordinary human individuals in this realm has been impaired and flawed. On top of that, in these times of spiritual degeneration, a continual degrading of our own and others’ lung ta is taking place. The mind becomes increasingly obscured and rigpa becomes increasingly hidden from the ordinary mind. When we pray to Guru Rinpoche and invoke his blessing, offer sang and engage in other practices that cause the flourishing of lung ta, we awaken the clarity aspect of mind. We awaken our rigpa, so that it is more perceptible to us. The ultimate point of such practice is to awaken the clarity aspect of our minds, to bring us into closer contact with our own rigpa. We may even discover the enlightened intent of kadak, or ‘primordial purity’, where neither suffering nor even the concept of suffering remain to be dealt with." Lungta has also become the name of practices related to — and causing the flourishing — of Lungta. Such practices are often related to Gesar, and involves Drala. The real nature of the manifestation we know as Ling Gesar through is that of Guru Rinpoche himself, appearing in the form of a drala. What is the reason behing the manifestation of Guru Rinpoche in the form of a drala? The function or purpose of drala is to increase that quality in beings which we call lung ta, or ‘Windhorse’. Guru Rinpoche saw that in future times, in this dark age of the Kaliyuga, people’s strength of mind and lung ta would diminish. So he manifested as Gesar, and gave many terma practices for drala and lung ta. Each of us has the ‘five patron gods’ (gowe lha gön) within our beings, and each patron god has a specific function. One of these is the dra lha, or drala. Dra means ‘enemy’, but bot in the usual sense of people we do not like or who do not like us. Here, ‘enemy’ means all thoss inner and outer factors that can harm us or function as obstacles to our accomplishing the path. Once we have overcome them all, we attain Buddhahood. This is why one of the names of the Buddha is ‘The Victorious One’. Drala is not so much a single deity as that within ourselves which eliminates whatever harms or obstructs us, so there are many kinds of drala. When lung ta is low, this means that the drala is inactive and that we need to ‘accomplish’ drala to increase the life force of the windhorse. We have to bring life forve and energy to the drala. There are many different aspects to drala, but the real meaning of drala is ‘rigpa’. Whereas the mind and lung ta are variable qualities and can increase, drala and rigpa do not. Mipham Rinpoche wrote this longer practice for offering the flag of windhorse (rlung rta) in 1903. It includes optional verses addressed to Gesar, Hayagriva, Ganapati (tshogs bdag), and Magyal Pomra (rma rgyal spom ra), the protector of the Amnye Machen mountain range. A short prayer to Dhvajāgrakeyūra (rgyal mtshan rtse mo'i dpung rgyan), a female deity whose dhāraṇī is particularly treasured as a method for enhancing windhorse (rlung rta). This brief windhorse invocation (rlung rta'i gsol bsdus) is a shorter version of The Swift Fulfilment of All Wishes ('dod dgu myur stsol); both texts were composed on the same day in 1903. This brief practice calls upon the goddess Tara and other deities to grant their inspiration and blessings, so that the practitioner's lifespan, merit, prosperity, renown, good fortune, magnetism (Wang tang) and 'windhorse' (rlung rta) may all increase. ↑ A Guide to Vajrayana Practice for the Rigpa Sangha, Section 3. Riwo Sangchö (based on teachings by Orgyen Tobgyal Rinpoche and commentaries by Gyalsé Shenpen Tayé and Dodrupchen Jikmé Tenpé Nyima), The Tertön Sogyal Trust, 2006. This page was last edited on 20 August 2017, at 15:37.